The first time Kay and I bumped into the work of Jeremy Whitley was when GeekMom’s Karen Walsh sent Kay’s now-10 year old an autographed copy of the first Princeless trade. She absolutely loved the adventures of Adrienne, and was absolutely speechless when we got to meet Whitley at AwesomeCon. By then, we’d become familiar with Whitley’s work through the Unstoppable Wasp series. There was so much to about Nadia Van Dyne, from her determined, optimistic outlook on life outside the Red Room to her passionate engagement in the sciences. It was heartbreaking when Wasp was canceled; there are so few mainstream comics to share with middle grade kids, especially girls. After all, Wasp is a gorgeous comic that embraces a diverse cast of girls in STEM, bringing in girls who are Black, Indian, queer, disabled, and sometimes more than one at once. At the same time, the book holds an intense discussion of trauma and its after effects, what it feels like to lose a parent you never knew, and how to create your own life after being controlled by an external force without ever for a second feeling like a morality tale. These are the kinds of comics I’ve been clamoring for – not just for me, but for kids like Kay’s girls. After hearing about the conversation he and Kay had at the convention, I wanted to have a longer conversation with Whitley about the topics they’d touched on only briefly in Artist’s Alley – middle grade comics, Princeless, Raven, and what he hoped to see in comics going forward. When we heard that Unstoppable Wasp was getting a second volume, it seemed like the perfect time to have a conversation about the comic, and that last piece in particular. I really couldn’t resist the title. Aaron Sparrow is nothing if not passionate. Twice over he’s worked to bring Darkwing Duck to comic books, and his work as a writer and professional has always seemed geared towards something I consider tremendously important – creating an accessible environment for new readers and kids. That’s no easy task in a world of crossovers, events and writing for the trade (now if only my local store could keep the book in stock!). With the release of the new Darkwing Duck trade paperback, he was able to give some of his time to talk with me about the way comics are created, his current Darkwing Duck series, and the impact both the character and comics medium had on him. I’ve been watching Toonami since 1998, and to this day, I marvel at what it’s accomplished. The Cartoon Network, now Adult Swim, animation programming block played a large part in bringing anime to the United States, was the Western progenitor of microseries with programming like The Intruder, IGPX, and Star Wars Clone Wars, and was responsible for airing some of the finest programming of its time. Toonami’s reputation as an outstanding cartoon block has as much to do with the packaging surrounding it as it does the programming itself. No other block would take commercial time to speak to the viewers like an individual about topics like anger, experience, courage, or discuss the fear that comes with following your dreams. A great deal of the tone, style, and quality of Toonami’s programming and packaging can be traced back to Toonami co-creator Jason DeMarco, who currently holds the position of Vice President, Creative Director, Adult Swim On-Air. When you first think of marketing, certain stereotypes can easily come to mind – the used car salesman trying to pass off junk as gold, or someone who treats their audience like sheep. It might surprise you to know, then, that Jason DeMarco is one of the most sincere people I’ve ever met. I personally believe his work on the Adult Swim Singles Program, an annual release of free music singles from various acts, is as much a matter of promotion as it is a chance for him to share the music he’s passionate about. Toonami, I think, is no different: each week is an opportunity to help bring what he loves to millions of people. There is no irony to his love of animation, television, and the work he does each week: the six hour weekly block remains an unpaid side project in addition to his day job. I was fortunate enough to conduct an email interview with Mr. DeMarco, where we discussed the return of Toonami after its cancellation in 2008, his role at Cartoon Network and Adult Swim, and the future of the better cartoon show. Everybody’s got a Firefly. That show that just gelled perfectly with your sensibilities, that you would follow to any timeslot, and was cancelled without sense or ceremony. My Firefly is Megas XLR. I saw the original pilot in 2002 at a friend’s house. It was eight minutes long, aired as part of an event to determine what should be picked up as a full series. 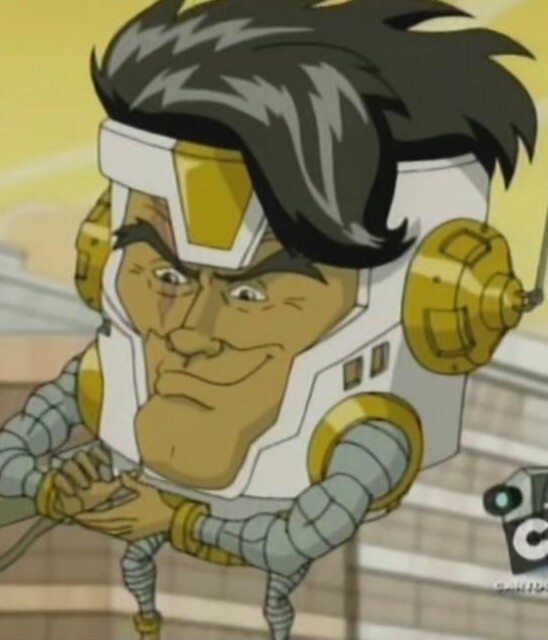 I barely remember what aired alongside it, but Lowbrow, the pilot that would eventually become Megas XLR, had me hooked. 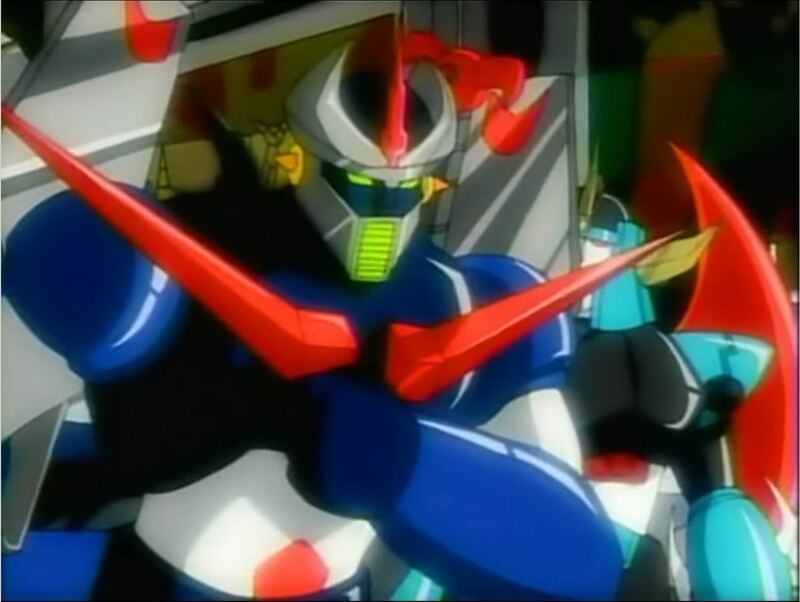 The show was a mishmash of giant robot anime, gaming, science fiction, comedy, rock, with an animation style and quality that blew its contemporaries out of the water. It felt like the show was the answer to a question I’d never even realized I was asking. When Lowbrow premiered as Megas XLR in 2004, I was there like a midnight showing for a new Batman movie. And for the entirety of Megas’ time on the air, I would catch every episode, new or rerun, that crossed my path. Two seasons of 13 episodes apiece just wasn’t enough. It turns out that I’m not the only one that thought so: After information was brought to light that the rights to Megas XLR may no longer be in Cartoon Networks’ hands, the fans made their voices heard. Chris Prynoski (supervising director for Megas) had his animation company, Titmouse, immediately figure out if there was a way to get the rights to the series back. Cartoon Network does own the rights, but had ‘written off’ the series (you can find out the technicalities behind that here). Titmouse is currently in talks with about purchasing or licensing the rights to the IP. 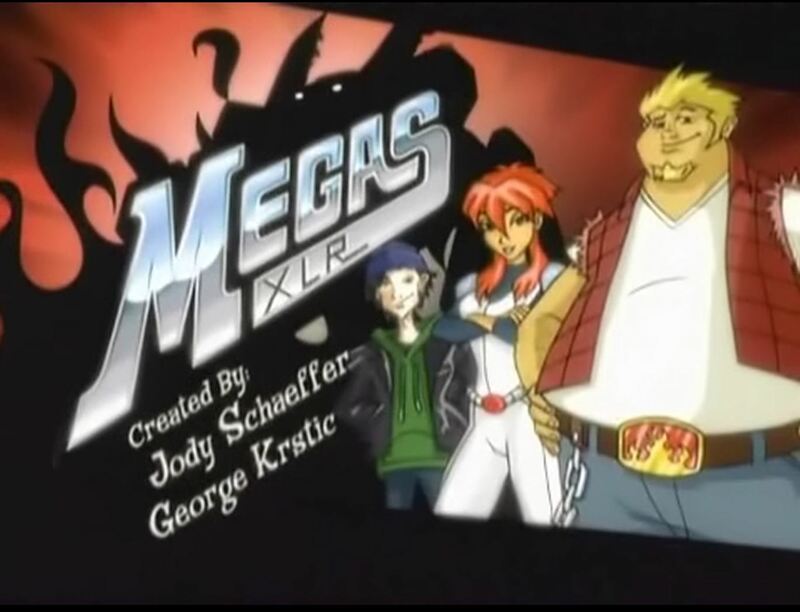 While talks are ongoing, I had the opportunity to speak with George Krstic, co-creator of Megas XLR and current Titmouse employee, about Megas and its role in things to come. This interview was conducted via Skype on 12/16/12, and transcribed (with minor edits for the sake of readability) due to problems with the original audio. Hi! This is so cool to have you here, it really is. Thank you for having me, this is cool for me as well. As we were chatting before, it’s always cool to connect with fans, and have someone out there who remembers our show, so this is awesome. I’d like to know a little bit about you and your background, so where did you grow up? I kinda grew up all over the place, mainly in a really small town in Ohio, but I had a lot of family in Europe, so we would spend a lot of time, you know, traveling around Europe. And, you know, went to college in New York, at a small art school called SVA (Editor’s Note: School of Visual Arts), though I think it’s gotten bigger since then, and I met a bunch of wacky animators and crazy film-makers, and those are the guys I’ve been working with ever since. It’s the same team of people behind Titmouse, and we did Downtown together, and then we did Megas, and most recently we were working on Motorcity. And the interesting thing that all three of those shows have in common, as I’m sure you know, is that they got canned pretty early on. In fact, Megas was our longest running show, oddly enough, we got two seasons on that. But yeah, that’s kinda me in a nutshell. You got it, got it in one. That he kind of dragooned you out of live action, in to animation. (laughs) That’s a very interesting phrasing, you’re absolutely right. Basically, after college I went in to live action and I was working on a bunch of really crappy TV shows, but I was learning the trade as it were. And Chris called me and he said “Hey man, I actually sold a show to MTV, I don’t know what the hell I’m doing, will you come and be the story editor on the show?” And I asked what a story editor does, and he was honest and said “I don’t know.” So I was like sure, that sounds great. So we kind of figured out everything on the fly, kind of like what we were talking about earlier, we got to learn the job on Downtown. But I thought it came out pretty well, we got an Emmy nomination. We only got one season, but I don’t see that as our fault, just kind of the network was going through some changes at the time. But yeah, Chris kind of sucked me back in to animation and I’ve been here ever since. With all the references going on in Megas I’m kind of surprised that animation wasn’t your goal from the beginning. What made you start with the ‘crappy TV shows’ that were live action? That was basically the first job that was offered to me, and as we spoke earlier, the dirty secret is that I can’t draw to save my life. So those two things added up to me going in to live action. I teamed up with Chris, and I also teamed up with Jody, who are artists and directors, so that way we could balance each other out where I would take point on story usually, and they would obviously take point on the visuals. Very cool. You know, I’m a little unclear as to what exactly Chris Prynoski’s role on the show was, because it looks like animation works a little differently in terms of a showrunner’s role in live action. Can you clarify that for me? Well, each show is different, each genre is different. For Megas, Chris was our supervising director, so he would set the directing tone, and we had a number of other directors who worked under him, our episodic directors. And Jody was the art director, he set up the visual look and feel of things, and Chris would work on timing and action and things like that. That is an excellent triangle right there. Yeah, the Triad of Evil. So, Downtown, at this point has been cancelled: And you’re sitting there waiting to write/draw/direct something. How did you get the opportunity to make the Megas pilot, Lowbrow? And that’s how the process began. We did that small pilot, called Lowbrow, and it was part of a voting program called, I think, “What a Cartoon”, and we actually got voted by the public to a series. And that is the winding story. Cool. Does that original pre-pilot pilot still exist? It exists and I think someone’s actually posted it to youtube. Okay, well I’m definitely going to have to look that up. I’m gonna come back to the way the pilot developed in to a series in a little bit, but I wanted to talk about the cast for a bit. So, in any other show, Kiva would be the hero, Gorrath would be the villain, and it’d be a tense dramatic battle across space and time for the future of humanity… and instead we have Coop and Jamie, who are a well-meaning slacker, and just a slacker. What was the idea behind that dynamic in the cast? That certainly explains casting Peter Cullen as the villain. Of course! You have to make Optimus Prime the villain once in awhile. I’ll admit, I am a big huge TV junkie and I was just shocked when his character just sliced that robot in two. (laughs) That’s right, we also had Megatron in there as well. I think – didn’t Megatron play a good guy? Yup, yeah he did. It was a remarkable set of bait and switches. I love that episode. I heard part of it was the cast of Cowboy Bebop that went in to picking the main cast, is that true? Yup, absolutely. I think that was it, there wasn’t anything else. We were huge Bebop fans, and we thought Spike and Faye were amazing voices, and were like “Wouldn’t it be great to work with them?” And then obviously the secondary cast, where people that were in franchises or films that we really loved as kids. We had Michael Dorn from Next Generation, we had Bruce Campbell from the Evil Dead movies, and we had Clancy Brown from so many movies. So we were just nerding out. I looked up David DeLuise’s past record and I was trying to find out how many voiceover roles he had, but how did you go from – and I say this with all the respect in the world because I love his voice work – but how did you go from Cowboy Bebop to David DeLuise? We wanted to take that expectation, in most shows that hero would be all angsty, and he’d have a certain kind of voice, but Coop isn’t that guy. We wanted kind of that big, full-bodied guy who loves life, and that was David DeLuise. Huh. And see, I always thought he had a great traditional hero voice, but it really shows what that combination of art and voice work can do. I love animation… if I dork out just a little bit over the process in this, I’m sorry. So once the pilot was selected, what was the process that went in to making it a full series? With any series you have to, obviously, you start with the scripts and – but once we had most of the first season down, we went to storyboards, design, layout, and then we would send a lot of the animation and the coloring overseas, we’d get that back, we’d do retakes… which, if you didn’t get what you wanted, you send it back. Then we start cutting it in, laying down color, laying in all the sound effects, etc. Obviously here in the US, we record the voices, and in Japan they record them last, so we recorded voices in there as well. And then the train was a-rollin’, at any one point in the series you might have seven shows that you’re working on at the same time. And yeah, that’s super-simplifying the process, but that’s basically how it went. How long did production on Megas actually go for, from Episode 1 to Episode 26? I think we were in full production for, I think, two years, something like that. Because we did not have a hiatus, we just ran, we got greenlit for a second season while we were still finishing the first, if I’m remembering that correctly. If we did have a hiatus it wasn’t too long, but I do remember the same crew working throughout both seasons. What was a typical day going to make some giant robots like for you, personally? It would really vary depending on what the schedule called for. When you’re in an executive producer or creator position, you’re kind of asked to oversee a lot of aspects. So one day you might sit in a script meeting, you might give notes on an animatic, you might go to a voice record, you might go to a board pitch, you might meet with voice actors, so it really, really varies. It’s not kind of, like, set in stone, it’s very loose and very flexible. Those days were eighteen hours, definitely, if not more. Wow… that’s incredible. When you sat down in a room to write episodes, did you write them for specific actors, because the idea that you can decide to have a villain voiced by Bruce Campbell who’s just a giant chin, and write it, is so fascinating. I’m curious if that’s the way that worked. I mean, what would happen is when we created that character, Magnanimous, we used Bruce Campbell as an inspiration. And obviously we wanted to use him as a voice, but sometimes those things don’t work out. Luckily we were able to get Bruce, he was very excited about the project, he was very cool. Sometimes it didn’t work out: We wanted to get General Zod from the old Superman films, but it didn’t happen. I forget what reason it was, but he was the inspiration for a character. But we tweaked things, we work around those things. Were there any episodes that you had in mind where you just couldn’t get them to work, no matter how hard you tried? Not really. I mean, we never killed an episode. I see that as kind of like giving up. I hear that that happens on other series, not necessarily always on animation, but… so I’d say no. I’m really happy with all the episodes. Each have their strengths and weaknesses, but we had a lot of fun making both seasons and I think that each episode has a lot to like. And what was your favorite episode that… well, I know you had a hand in all of them, but what was one, or a couple of, your favorites? I really like “Bad Guy”. I think that was my all time favorite. And a close second would be the series finale two-parter. That was also solid, I thought. That was one thing that really struck me, looking at it as a fourteen year old and looking at it now: It was the only two-parter you guys had, and it didn’t feel like a different show, but it had a very different tone compared to the rest of the show. At least, it felt like it to me. What was your thinking making that different kind of story? That was a good observation. We got cancelled in the middle of the second season, we knew we were done. So we wanted to go out with a bang, sorta wrap things up, so we went a little darker, and then we felt because we went darker, the comedy would play a little better. So that’s why, yeah, you’re absolutely right, we did alter the tone a little bit. I guess there’s no delicate way to put this: But what was it like to be cancelled on Megas? I mean, obviously it’s not great to get any project cancelled, but that’s part of the business. And we got cancelled on Downtown, and we recently got cancelled on Motorcity. Every show gets cancelled, it’s not as heartbreaking as one might think, it’s just part of how things work, unfortunately. Maybe one day we’ll get to a point where we can make a show as long as we want, but we haven’t found that balance yet. How much of you would you say is really in Megas? Well Coop is based on a good pal of ours, who still lives in Jersey City, and Goat is actually based on a pal of ours who lives in Jersey City named Goat. So we took inspiration from a lot of people who we know, and a lot of pals, and a lot of experiences, so there’s a lot of us in there, and there’s also, you know, there’s our specific things that we’re really in to, that we’d work in visually. We had a great group of designers, and you can tell the things that they were in to. Whether it was Star Blazers Yamato, Gatchaman, G-Force, etc., everybody on the show put some of themselves in to the show. And that’s what I like about it. To be perfectly candid, this is odd. From the outside looking in, you see this kind of thing going on with Firefly, sending nuts in to save Jericho, but this is very different in that Titmouse is actually trying to purchase or license the property. But I only have an outsider’s perspective on it. I’m curious what it’s like for you, to see all the support going on. It’s wonderful to see all the support, and part of the reason we’re doing this is because of all of the fans kind of rallying behind it. We’re still in the early stages of talking to Cartoon Network about exactly what we could do, whether it’s getting the rights back, or actually purchasing a license to our own show, or trying to get it resurrected somewhere else. There’s a thousand different things that we’re talking to them about, seeing what’s realistic, but yeah, we kept getting emails, we kept getting, any time we went to a convention… people are actually calling up Titmouse and asking about Megas. So it’s been long enough that it’s been dark: Megas is playing everywhere in the world, except for the United States, which we thought was odd. We want to do anything we can to bring it back. The Nielsens are such an odd system. (chuckles) It’s a very outdated system, and it’s, I’d say it’s catastrophically wrong, many times. I think that in five years, no one will be using Nielsens. I think so, I think things are changing, I think TV is changing, I think the way we access entertainment is changing. So I think that the days of sitting at home, making an appointment and watching the big box, I think those will come to an end in five to ten years. Television is such a very odd… When I look at Megas, I swear this is what came to mind when I saw the Bring Back Megas movement, is Baywatch. In the first season, the ratings were junk. But David Hasselhoff, for whatever reason, managed to figure out that this was probably the most genius idea that had ever happened in terms of making him money. So he actually bought the rights to the show, and put it in syndication. I didn’t know that, that’s awesome. So I guess my question to you, at least the first one is: Is Megas the next Baywatch? Our show doesn’t have those things, we’ve got other things. We’ve got giant robots. Yeah, the acting and the writing, right? Oh yeah, absolutely. Just gorgeous cinematography. Television is may be the, and I apologize if I’m editorializing a little bit here, but I’m really curious to hear what you think about it since you work in this business. Television is unique in that there hasn’t been really, creator-owned content, and really can’t be the way that television has traditionally has been delivered. It’s been produced by soap companies, networks, and government subsidies for PBS… and now with what Titmouse is doing, and the work I’m being seen done with Arrested Development coming back on Netflix for a fourth season, it makes me curious what you think is changing in television. Well I think again, it’s the aspect of distribution. As before, it was very traditional, and there were a lot of gatekeepers, and now with the broadband aspect, and the fact that you can access entertainment on a cell phone, or through a browser, I think that’s changing. The playing field is being broken up now, and the blockers are being lifted. It’s gonna be a new world out there soon. Do you think Megas could be one of the pioneers in that new world? Well that’s what we’re trying to do, that’s why we’re talking to everyone and anyone… we’re talking to video game companies, we’re talking to, you know, online distribution. We’re trying to find a way to… all we are is just, we’re just a bunch of storytellers. We just wanna tell stories. We’re not in this to make money, we’re not in this to create empires. It’s just the people who own the distribution are very specific about how they control things. If you don’t get the ratings, if you don’t sell the ads, if you don’t sell the toys, etc. They cut off distribution. So we have to find a way to get these stories out there, and to fund these stories. But looking at this, it’s kind of a brave new world out there,so that’s why we’re exploring all these other options. That’s why Titmouse and I are talking to everyone and anyone, trying to figure out what this new model is. Assuming that you removed the BS&P, the restrictions so that you weren’t worrying advertisers… without those restrictions, in this hypothetical place where you can create Megas for the first time again, in this new distribution model, what do you think you might have done differently with the show? Honestly, I really feel we made the show we wanted to. The creative executives were awesome, they really supported us. And the comedy was the kind of comedy we wanted to explore. So if we could do it again, obviously we’d probably try to redefine the designs, and some of the storytelling, but I feel pretty good about what we did, and if we can capture that tone again? I think that’d be a big win. It’s unusual and very gratifying to hear a creator to say of a cancelled work that they’re happy with the result. Absolutely. All of our shows we’re very happy with, because they’re all passion projects. They were shows that we came up with that our team, that have been working together for years, put their heart and soul in to it. So we’re very proud of each of our shows. And we’re proud of the next shows that we’re working on, we have a lot of stuff in development that we’re very proud of, so hopefully one or two of those things will go as well. But yeah, absolutely, each show that I’ve worked on I’m very proud of. I think you have good reason to be with how much fan support you’ve been getting for bringing back Motorcity and Megas… I told some people that I was going to have the chance to talk to you, and they didn’t know what they wanted to ask about Downtown, but they at least wanted to say that they loved it. Well we appreciate that, I’ll definitely let Chris know. I’ve heard you talk about you wanting to have some toys for Megas. Now what kind of toys, in particular, would you really most want to see? Something that I’ve been talking to people on twitter about is we’re seeing what the reality is of putting out die-cast toys for Megas. Because that’s something that I know personally, die-cast robots. And I think there’s a market for it. But we’re trying to figure out what the reality is. Some of the things we’d like to do is, you know, die-cast magnetic Megas so you could take the car off. Obviously his chest would open up, and different weapons would come out, and things like that. But this is all still in very early brainstorming stages. Sure. I can’t imagine how complex the rights issues must be. Yeah, they’re kind of a mess, but hopefully we’ll work through that. I can tell… I actually looked up the tax-write off that Cartoon Network did. Yeah. I had a lawyer look at it, and he was still a little baffled, and he explained it to me. I kind of understand what happened, but just looking at it, it really does surprise to me to think that quality is not banked on first and foremost as the cash-making method for television. And I’m not trying to dismiss Disney or Cartoon Network or anything like that. Oftentimes, we just end up seeing these shows we love getting cancelled, and we end up wondering why. Yeah. But then again, quality and also, what’s interesting to one person is not to another. It’s all very subjective. And as I mentioned earlier, the networks are also using an outdated system of gathering information on what’s popular and what’s not. So I have a feeling that sometimes they’re right. Sometimes we didn’t make a connection. Other times, they’re probably horribly, horribly wrong. And in the three shows that we’ve gotten cancelled, probably somewhere in there they’ve been horribly wrong. I’m not sure if each time they’ve been wrong, but they probably did not get each one right. Yeah. Because the second that word got out that Megas was in any way open, the floodgates really just opened. The internet gave a voice to the people who didn’t have access to those Nielsen boxes. You’re absolutely right. The thing is, those voices were always there, they just didn’t come together until recently. I’ve been getting emails since we were cancelled, consistently, people asking “Where can I find it”, are there any merchandise, what’s going on, and Titmouse as well. We’ve been hearing you, and we’re gonna try to do something about it. I’d like to talk a little bit about what’s also going on in the future, because I’ve heard some stuff from you. Something about some stuff on SyFy, something at Nickelodeon… what can you tell us? I can’t really say much because we’re in very early development, but I have a series, a live action series at SyFy that’s in development. Hopefully we’ll find out if it’s going next year. And I also have an animated series at Nickelodeon in development. In addition to that, Titmouse has just… like fleets of shows in development, which I’m very excited about. So I’d say in the next year or so, my hope would be that we get at least one show picked up. But you never know: We might get everything shot down. That’s part of the biz. I don’t think I’ve spoken to anybody who worked with you who was not just elated to hear that the show might be coming back, and that you guys are doing as well as you are. And that these opportunities for new shows, and the goals for Motorcity and Megas are happening. That’s very cool to hear. And that kind of stuff gives us the energy to keep moving forward, because at the end of the day we’re fans, just as much as fans of our shows are. So we are the nerds who go to the conventions, and we geek out on the same stuff, so it’s really awesome to hear that kind of thing. You’re the first generation of what they call the ‘remix culture’, I think. Yup. Taking the things that are old, making them new. Homages, parodies, all those things just coalescing as things are made new. You are, I think, leading, along with Titmouse, a very unique charge to change television. We’re trying, we’re trying and we’ll see what happens. I’m sure we’re gonna fail you in some way, but that’s how… I don’t mind failure, because obviously we learn from failure, we make the next thing and it’s better for it. I’m happy to keep trying, as long as you guys will come along for the ride and watch this crazy stuff we’re making, I’m happy to keep beating my head against those walls. Of the shows that you’ve worked on, what do you think is maybe your favorite story to tell about the production? You know what, I would have to say that there’s a lot of great stories with Megas, because that was a show that I had a hand in creating. There’s all kinds of great stories, there’s all kinds of painful stories too, but I’ll give you one story to kind of close things out which was pretty awesome, going back to Bruce Campbell. And Bruce was cool enough to say like, “Hey, let the kid through.” And he took the script, and he actually read it, and was like, “I love this show, I wanna be part of it.” I think that story kind of sums up how people reacted to what we were doing, and also how crazy we were. That one of us basically attacked a celebrity to make him part of our show. Wow. Same strategy that got the show started to begin with, I guess, huh? Yeah, that’s true, I wasn’t even thinking about that. I mean, that’s what I’d say to your listeners and yourself and anyone else: If you wanna make something, just do it man, find a way. Don’t do anything that will get you in jail, don’t attack anyone physically, even though we did. Just do what you gotta do to get your stories told. I think listening to this that a lot of people that watched your show, and the shows that you and Titmouse are going to affect are going to do just that. I wanna watch your guys’ shows. I’m just as big a nerd as anyone on the con floor, so I can’t wait to see that stuff. Well thank you very much for talking with me. Is there anything you’d like to say that I just should have asked, shouldn’t have missed, or you just wanna say? No man, I think you did it all. Thank you again for the opportunity to listen, well, not to listen, but to speak to your listeners. And yeah… it was very cool. Thank you for having me. Well, ladies and gentlemen, if you’ve been paying any attention to this blog you know I’m a huge fan of Don Rosa, and that I’m extremely excited for the “Don Rosa Classics: Deluxe Edition” volumes that have been published by Jano Rohleder (link here: www.indiegogo.com/donrosa). They’ll be reprinting Rosa’s most well known independent comics “The Pertwillaby Papers” and “Captain Kentucky”, and a piece of my original interview with Don is actually going to be in one of those volumes! I’m not even going to pretend to be objective about this, that’s one of the coolest things ever. Jano, a longtime friend of Don Rosa and editor of all three volumes of the “Don Rosa Classics: Deluxe Edition”, agreed to do an interview with me in the last leg of the fundraiser to talk about his role in the creation of the books, his relationship with Don, and just why he’s made the effort of getting these rare classics published. 1. Jano, you’re clearly a big Don Rosa fan, I think this collection is proof of that, but what about you outside of that? I’d like to know about your background, your interests, and whatever else you think gives people a good view of who you are. Well, I’m 26, a student of American and German literature, part-time publisher and also freelance editor and translator for the German branch of Egmont, where I’m one of the people working on the German Disney titles. This pretty much takes up most of my free time, but when I’m not working on some books, I love watching movies and American TV shows and have a pretty large collection of those. An illustration for one such TV show to be included in the collection. 2. So, what’s your role with Don in the context of Disney comics? I’ve been the editor for the German edition of his works for about four years now. I had translated “A Letter from Home” in 2003, but only got in charge of his books in 2008 when we did the new edition of the “Life and Times of Scrooge McDuck” one-volume collection. As per Don’s wishes, I’ve done new translations for nearly all of his stories. When a book boasts his name on the cover, he wants the story to be presented as they were originally intended by him, so the translation should match his original text as closely as possible and don’t insert additional (more or less funny) gags or anachronistic references (like on “Jurassic Park” in “Return to Forbidden Valley”). I’ve been working on the final four volumes of his German “Hall of Fame” books and I’m now the one in charge for the German “Don Rosa Collection” that reprints all of his Duck comics in chronological order and with tons of bonus features. 3. Don’s work speaks to a lot of people for a lot of different reasons, and you’ve been pretty closely involved with his work for awhile now. What makes you such a fan of his comics? I can’t tell you, really. I just like his stories, because the writing is really good, and I also like the art, even though it’s a matter of taste and certainly doesn’t appeal to all readers. I also have to say that I’m no “Rosa super fan”. I’m first and foremost a good friend of his, but I don’t see everything that he does through rose-colored glasses. I don’t say: Oh, that’s a Rosa duck story, I love it without reading it just because it was done by him. There are several duck stories of his that I think are pretty weak, especially among his last ones. And even Don knows they are because they were done at a time where he’d already started not wanting to continue his work for the Disney system anymore. His earlier works, and also the “classics” stuff that we’re now collecting in these three books, is something completely different, however, because you can see the fun he had in each of the drawings. 4. 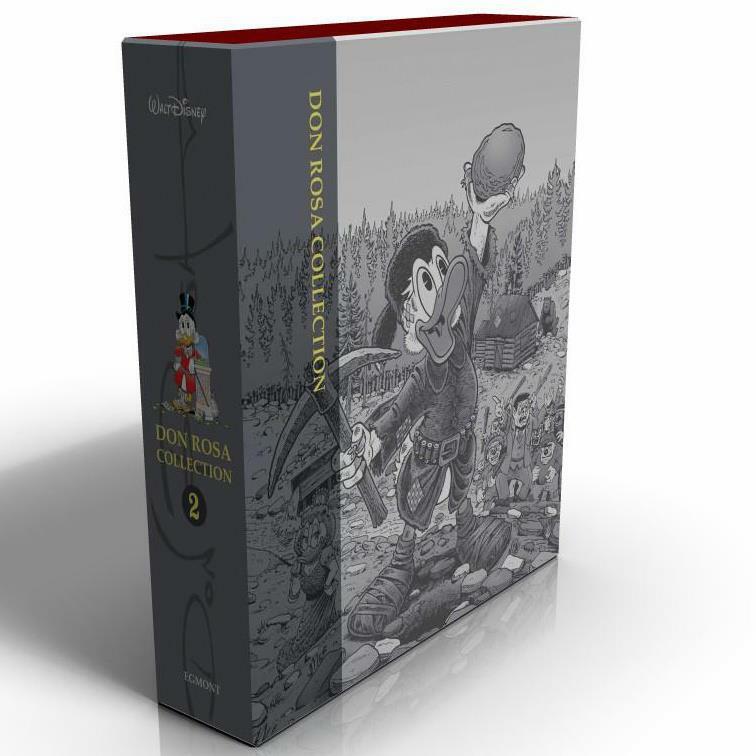 You’ve worked with Don’s compilations for awhile now, not just on the “Don Rosa Classics: Deluxe Edition”, but the German “Don Rosa Collection” containing his work with the Ducks. How did you first start working with him personally? Well, I first met Don at a signing in Germany in 2000, but we didn’t know each other then. The first real communication related to work was in 2003 when I translated “A Letter from Home”. I later did some interpreting work for him during his 2006 and 2008 signing tours, and that was also when he suggested I should be the one in charge of his German editions. 5. What is it like working with and being friends with Don? Well, for me it’s pretty easy to work with him because I know what he looks for in a publication of his work, so there’s never much of an argument. For the classics, for example, he only had some tiny suggestions for improvements (like “Tagdenah” being shown after “Khulan” because it’s newer, which obviously makes more sense than the other way round). And on a personal level, it’s always much fun meeting Don since he’s a pretty fun guy. A photo at Don Rosa’s home. It seems that fans had asked Don for some years to film his studio so they could see where he worked and what his collection looks like etc. He finally did a video like this in late 2010, and originally I was only supposed to do some editing and putting it online. The problem with it was, however, that you couldn’t see Don because he was filming, of course, and… he spent even more time than in my video looking at his duck collection (I think there were about 40 minutes). Since I was going to visit him some months later anyway, we came to the conclusion that it would be better to do a new video filmed by me so that he could be seen on screen and not just be a voiceover. This was actually Don’s idea (he liked the short clips I had shot during his German tours and new I had a good HD camcorder). I then suggested to make this a full “house tour” because even though his studio and comics vault are interesting, I thought it would be even more interesting to see how these rooms fit in to Don’s house as a whole and how he lives in general. And I think we shot a fun little film there. Of course, it’s probably only interesting to Rosa fans, but the parts about his studio and collection might also be interesting for comic readers in general. 7. Don touched on your role in the creation of the book collection in my interview with him, being the person who initiated it and put it all together, but what was your reason for working to get his old comics published? I had been looking into the possibility of doing a German edition of his classic comics for some years, but that never really came together, also due to the lack of time caused by work that was actually paid for instead of just being some “on the side” hobby like this would have been. But this year, it all happened pretty quickly. Originally, this was only supposed to be a kind of “goodie” to be sold during the signing tour. I looked up what the production would cost, and since neither Don nor I would and could have afforded to pay that in advance, I started the original Indiegogo campaign for the first two books in June, and it was an immediate success with fans all over the world. That’s when the “small signing tour project” became an international project with preorders from all over the world. I think this was also the only chance this could have worked. Any translated edition of these comics that has been published so far wasn’t a huge success from what I know (due to the limited readership), so an English edition for fans all over the world was the only way to go, I believe. 8. What exactly does editing the “Don Rosa Classics: Deluxe Edition” mean? What all do you do to put the book together? Just putting these things out wouldn’t be hard. But since I always want to get the best possible quality when I buy a comic, that’s also what I aim for when I’m editing them myself, of course. This means hours and hours of scanning, writing, typesetting etc. The easiest part were the comics themselves because they had already been scanned by Don for the Norwegian edition twelve years ago, but the bonus features took an awful amount of work. To ensure the best reading experience, most of the old articles and interviews were “digitally restored” which means I didn’t just put a scan of a faded and smeared old print in the book, but did a new typesetting based on the original layout. I think the result was worth it, though, and I hope readers will agree. It also means being in constant exchange with Don and other fans in order to obtain copies (or better copies than the one I had at hand) for the stuff in the bonus section, and bringing it all together in one big volume, or, better to say, two big volumes. It was a lot of work and I can’t wait to get my hands on the final product! The first two volumes, printed and ready to read! 9. And what has Don’s role been in this process? Don helped out with copies of some of the art (like the Italian CK cover or the PP/CK bridge scene), with newspaper articles from his archive, and he also helped me get in touch with the people who have contributed introductions: Ron Weinberg, Ray Foushee, Roger Stern and Don Murphy. 10. After the first campaign ended successfully, a new one went up, this time to fund an art book. What made you want to publish a third book on top of the first two? The idea was actually older than the one for the first two books. When I visited Don in 2011, he gave me a huge stack of copies of his fanzine illos, old comic strips and much more, about 400 pages. Since the German edition of PP and CK still wasn’t gonna happen anytime in the near future, I immediately thought about doing an art book with these illos because they are really fun to look at. I didn’t know when exactly that would have been produced, though. Then the international edition of PP and CK happened. And the success of the first two books was a good reason to dig out that original idea again since there were obviously quite a few readers interested in that old “classics” stuff. 11. Outside of the Information Center drawings, what can fans expect to find in this collection? Don did *hundreds* of IC pages, so these illos will be the biggest part of the book. But there will also be several other stuff, like comics he did together with Ray Foushee during their high school time, a whole bunch of “fake cover illustrations” he did for the host of a local TV show (who would then show them every week during his night program), “mini comics” from school in which Don summed up recent school events in a funny way, and also a lot of political cartoons and advertising illos from his school/college papers and local papers. Most of them have never been seen before (at least not by people who didn’t go to the sames schools as Don). 12. 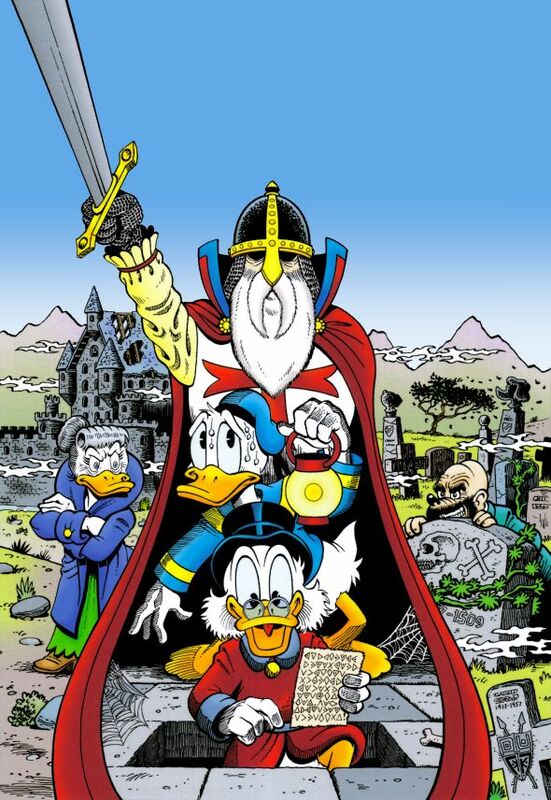 Now this one’s just for fun… what are your top three favorite Don Rosa stories? As with question three, I can’t really say. I don’t really have “favorites” because there are too many I like. If I had to choose, the one dearest to me is “A Letter from Home”, of course, because it was the first Rosa story I ever officially translated. Otherwise I can only give a general statement by saying that I prefer the adventure stories over his shorter gag stories. And, of course, I like “The Life and Times of Scrooge McDuck” quite a lot, even though I, personally, wouldn’t have needed that many “additional chapters”. 13. Do you have a good Don story you can share? And by that I don’t mean a comic, just a personal anecdote. Oh, sure. His hot peppers are always a running gag when he visits Germany. There’s always a bunch of them on the signing table for people to take and he even brings plastic bags for those who want to take home even more than one. When we were in Frankfurt for the book fair two years ago, he came over to me during dinner (there were two long tables, and he was sitting at the other one) and with the words “give those out” gave me a huge bowl full of peppers which I had to distribute to the others… after each and every one got their pepper, nobody wanted to be the first one to try one, of course, so *I* had to be the one or they wouldn’t have started… (don’t tell them I knew which ones were hotter than the others and chose a relatively harmless one). Oh, and when there are dogs, it’s also always a pretty, uh… “interesting” experience. Like Don suddenly running away in the streets shouting “Here, doggy, doggy!” to pet a dog of some stranger some hundred meters away. 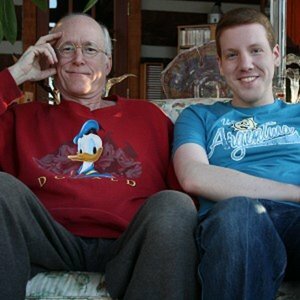 I conducted an interview with Don Rosa. Even typing those words seems odd, as though I’m writing a lie, even though I have the proof in front of me. He’s my favorite cartoonist, popular all over Europe, been on national talk shows… and he agreed to do an interview with me. For those of you not in the know, Don Rosa is one of the most popular Disney Duck comics authors of all time, most likely second only to the departed Carl Barks. Active as a Duck author from 1987-2007 (and STILL active in reprint editions of his comics! ), his best known work is the Eisner award winning The Life and Times of Scrooge McDuck, a 212-page story covering the life of the world’s most popular comic book character, multikazillionaire Scrooge McDuck. His stories have been reprinted all over the world, signatured by one of the most unique art styles out there and truly inimitable writing which delves deeper in to the characters than any Duck author before him… or since. But Rosa didn’t spring forth from day one as a Duck comics legend, pen in hand. 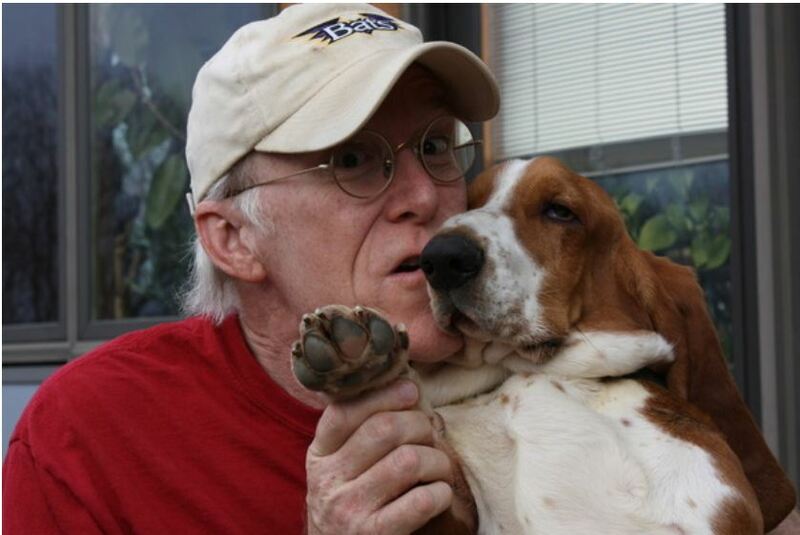 As far back as his freshman year in 1971 at the University of Kentucky, he was a published cartoonist with The Pertwillaby Papers, an action/comedy strip in the spirit of Barks’ Duck comics, in his college newspaper. The Pertwillaby Papers ran in The Kentucky Kernel until 1973, picking up in a new comic book style format in the fanzine Rockets Blast Comicollector from 1977-1979. That same year he returned to the newspapers with Captain Kentucky. 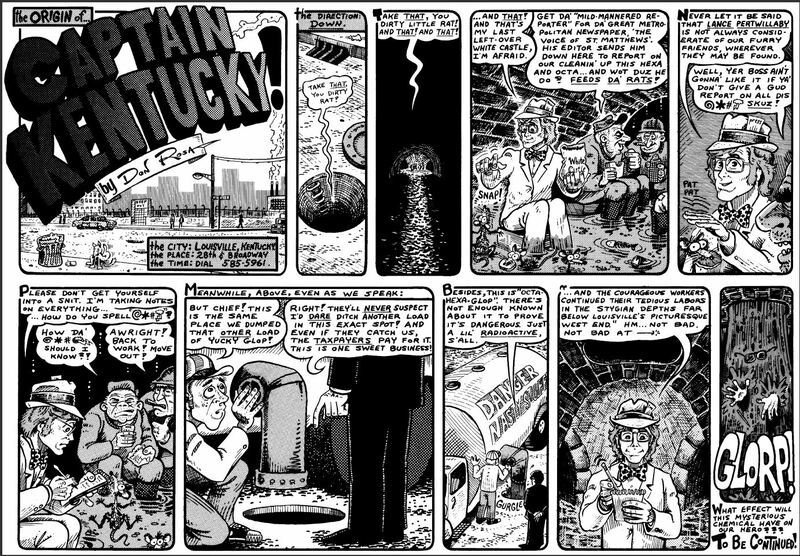 Running for 150 half-page strips in The Louisville Times, the comedic superhero strip took place in real Louisville locations with real people, commenting on current events and lavishly destroying Louisville landmarks. In support of the reprint collection I held an email interview with Rosa, posted below. 1 – So how did this reprint project come to be? Jano apparently talked to me about it a year or two ago, and at the time I said it was okay with me if he reprinted the comics, and apparently he even obtained the art-scan CDs from the Norwegian publisher of 12 years ago. Then I completely forgot about it. 2 or 3 weeks ago he mentioned it again, and directed me to that Indiegogo site, and I was amazed both by what classy books he was planning, but also by the whole “Indiegogo campaign” process. I was not at all aware of that phenomenon! I won’t say that reprinting those weird old comics of mine is a “great idea”, but that Indiegogo concept is brilliant (assuming some of those charity campaigns are not phony). 2 – These comics are filled with homages to more things than one could reasonably count, in style and content. It’s very clear you appreciate all sorts of media, television, movies, comics… spot-the-reference is a very fun game to play with your work. But amongst all the homages, what were some of the bigger influences on these comics and your work in general? I never have written or drawn my comics to consciously imitate the style of any other author or artist. I just loved to tell funny stories and I let the stuff pour out in the only way I knew how without analyzing it. The best part of that is that I never intended to do it for a living, so I never had a reason to force myself to develop a style that anyone liked but ME. So my influences (besides Barks) were not conscious ones. But when readers tell me what my storytelling and humor remind them of, I know who those influences are, such as Bill Elder, Harvey Kurtzman, John Stanley — my sister had LOTS of MAD comics and magazines and LITTLE LULU comics of the 1950’s along with all her Barks Ducks. And in the early-mid 1960s when *I* started buying my own comics, I discovered Will Eisner, Walt Kelly and the Superman writers and artists who worked under editor Mort Weisinger in the late 50’s – mid 60’s. Those latter comics are what gave me my love of limited-continuity, “untold stories” and “secret origins” — Weisinger introduced those to comic books. Readers mention all of those as obvious influences, and considering what comics I loved to read proves them right. 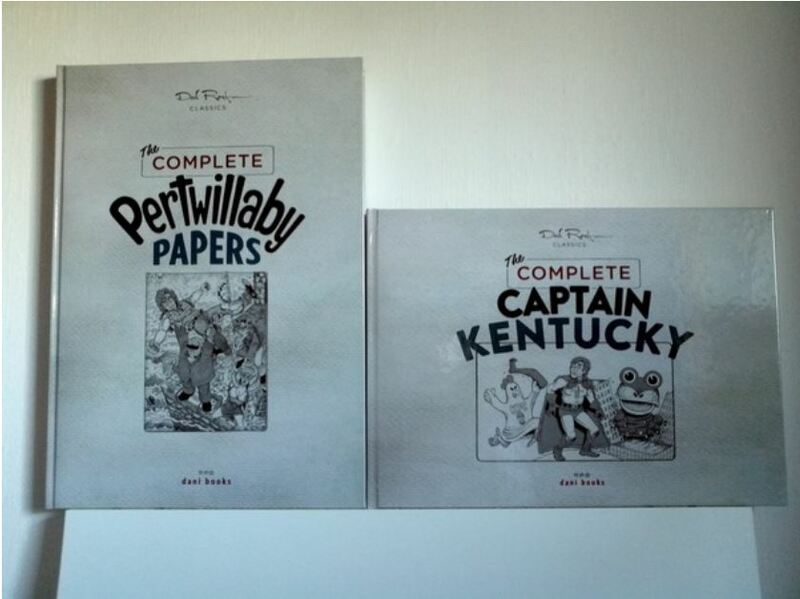 3 – What separates your work with The Pertwillaby Papers and Captain Kentucky from your work in Duck comics? For example, are there elements you deliberately chose to (or not to) use with these comics versus the Ducks? Hm. I never thought about what I had done stylistically in any previous comics once I started doing stories of Barks’ Ducks. I only thought about what sort of story *I*, as a Barks fan, would like to read. That’s not to say what ANOTHER Barks fan would like to read — I can’t know what that is. All I can do is do my stories my way. Which is what I always did. I was never told what to do by editors — they seemed to know that they had to let me do it my way (with limited guidance). And since I was never paid a royalty on sales… in other words, I never benefited from the popularity of what I did… I never cared if it sold well or not. That was the publishers’ concern. I just did what I wanted. And maybe, since I knew how a Barks Duck comic should be, I did it right enough that the editors let me fly free. Yes, I reused the plot ideas from past comics, but I did not try to duplicate the style. 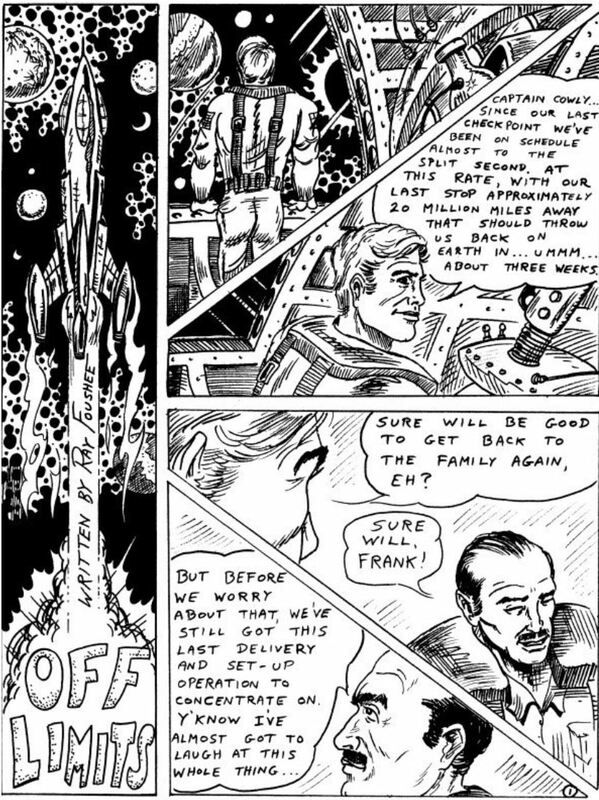 4 – After the end of your first Pertwillaby Papers adventure in 1973, no new episodes were made for three years, at which point it switched from the newspaper strip format in The Kentucky Kernel to 10-15 page episodes in The Rocket’s Blast Comicollector. What was the story behind that? You mean what did I do between 1973 and 1977? That’s when I was writing and illustrating the “RBCC Information Center” where I would answer readers’ questions about the history of comic books, movies and television. In those days, I was the only public source IN THE WORLD for answers to such questions — like “list all the TV appearances of so-and-so actor” or “list all the movies that so-and-so directed” or (my specialty) “write an index of such-and-such a TV series with airdates, episode titles, plot, character names and cast, writer and director. I could do things like the latter since one of my (many!) collections was a complete set of TV GUIDE magazine, and in the “old days” the listings for each TV show included ALL that info. And I had many other limited-edition movie & TV reference books. And for comics, I had my exhaustive comic book collection which included virtually every American comic published since WWII. And as I said, I included many wacky illustrations to go along with my Q&A subjects. Nowadays you can get such info, and all other info, instantly off the Internet! That’s a LOT better than me being the only such source with my tiny audience! Anyway, after doing that for 3 or 4 years, I felt like I missed creating funny adventure stories. So I turned over the illustrating of my “Info Center” to others, and recreated “The Pertwillaby Papers” as a comic book style thing. 5 – Your most well known works are in color, but the reprint collection is all in black and white. What sort of differences are there in the way you draw when you know the end result for the reader will be black and white? Oh, yeah, there’s a BIG difference. When I knew my work would only be in b&w (which I thought was fine) I had to use “Zip-A-Tone” to create “simulated color”. “Zip-A-Tone” is an obsolete method of adding texture to artwork for b&w printing, used in all magazine ads and comic strips up until the computer age. It was VERY tedious! It involved hundreds of different types of texturing printed on a clear plastic adhesive-backed film… all different sizes and % of teeny-tiny dots and stripes, plus an endless variety of weirder patterns, as well as symbols used on architectural and engineering drawings. You would place the transparent sheet over the art, use an X-acto knife to cut out the intricate shape you needed to cover the area you wanted to fill with a texture, peel the cut section off the film, lay it precisely over the area on the art, and rub it down with a wooden burnisher. When you see how MUCH of this I used, and you realize that each textured area was done in this tedious fashion, and how complex my art was then (much more than my later Duck comics), you can imagine how LONG this process took even AFTER I’d drawn those panels filled with millions of ink lines. No amount of money could pay for that sort of labor! That’s why it was lucky it was done as a hobby, always for free! 6 – It’s fairly well known that elements of your Pertwillaby Papers were re-used in Duck comics, which makes sense considering how much you were inspired by Barks’ wonderful work to begin with. While you’ve stated that “Lost in (an Alternative Section of) the Andes” was directly written with the Ducks in mind, is that true of your other Pertwillaby Papers stories? Um… let’s see. My “Universal Solvent” story used a lot of the plot elements from my “Vortex!” adventure, though I skipped the idea of the solvent being distilled from a Black Hole from outer space. My “Once and Future Duck” story used some of the plot from my old “Knighttime” adventure. (But I don’t think either of those made good Duck plots. Too weird and/or SF-y.) “Incident at McDuck Tower” reused a sequence from my “Sub Zero” adventure. And there was at least one other incident which I’ll save for an answer to your question #18! I read Sub-Zero from an old Fantagraphics reprint, and I could ‘feel’ Donald and Scrooge Barks moments, if you catch me (largely in the gags) and the villain seemed like a very Barksian one-shot character. There’s certainly a unique feel to it, and it doesn’t feel like an imitation. But I had to wonder how close the Ducks were to your consciousness at the time of the writing, and whether these Pertwillaby Papers stories were in a way Ducks in disguise. The PLOTS were Duck stories in my mind, but I was never equating any of my characters or their roles in the plot with the Barks Ducks. I know that Schuyler Roatch was a bit annoying like Gladstone Gander. And Prof. Gerry Atrix was a bit like $crooge in that he was short and old and had done a number of interesting things in the past… but he had none of $crooge’s vitality or wealth or other personality traits. No, I saw no Barks Ducks in my characters. 8 – Is there a reason that the main plot of “Sub-Zero” was never re-used as a Duck comic? It certainly seemed like it could be an interesting Arpin Lusene story. 9 – I was thinking Brutopians, actually! Though I have your Duck version of the Captain America cover, I’m pretty sure Scrooge could take on Nazis just fine… but I’m certainly glad that you chose not to deal with such things too much in your Duck comics. But this does get me to a point I’ve wondered about for awhile, fanboyish as it might be. My memory is hardly perfect, but I seem to recall only two mentions of Brutopia in your work. One from “The Crown of the Crusader Kings” and one from “Attaaaack!” With all the Barks homages in your story, was there a reason it wasn’t used more often? The Brutopians are the Russians, and they could not have looted European museums in WWII (if you refer to that specific plot in “PP”). Nor would I make even a mention of the Nazi atrocities of WWII in a Duck comic. In fact, in my mind I decided that $crooge had retired around 1942 due to the outbreak of the World War, as he did not want to be involved in war profiteering which would be unavoidable for him otherwise. But, as I say, I only allowed myself to say he retired “5 years before 1947”, but I would never mention WWII in a BarksDuck comic. And once in “Curse of Nostrildamus” and maybe somewhere else. >>>>>With all the Barks homages in your story, was there a reason it wasn’t used more often? Simply because I didn’t need to have $crooge’s adventures involve world politics. It’s MUCH better to have individual villains acting for their own personal avarice or malice. 10 – What was the inspiration for the creation of Captain Kentucky? He’s most certainly not a traditional superhero, and the strip itself is not a very traditional comic! By the late 1970s I was known around Louisville as a local “eccentric” in that I was a comic book collector and cartoonist. In those days, that was ODD. So the editor of the major local newspaper entertainment magazine section invited me to contribute a weekly comic strip. I think he wanted just a 3-4 panel single strip, but I told him that I only did comedy-adventure and it was impossible to do a continuing story in only 3 or 4 panels a week. He agreed to a “Sunday” style strip… but he didn’t increase the pay… but that was okay, I was still a cartoonist strictly as a hobby. He also didn’t tell me to draw in the ugly overly-complex style that I have. The pay was $25 per week, which I think averaged to about $1-$2 per hour. So, what? It was fun. Oh, but how did I decide on a superhero? I recall that my two ideas for a continuing adventure story was either a detective (titled “Investigations of Noah Vale”) or a silly superhero. But I chose the superhero for the possibility of drawing spectacular stunts which would result in terrible disasters, and so forth. Oh, and I also decided to use actual locations and local people as the other characters. Yes, THAT idea I thought was unique in the entire nation! And I was half expecting that I would be on the national news in a matter of weeks. But not only did the strip not garner national attention, I couldn’t even tell after 150 episodes that it was having any LOCAL attention. When that happens, rather than thinking “it sucked!”, I decided it must have just been “ahead of its time”. So I quit and that’s when I decided that cartooning would no longer be a hobby since it was too frustrating that no one much liked the kind of stories I wanted to tell. I put the old drawing table in the basement and didn’t draw another line until fate stepped in four years later. 11 – Could you give the readers a little taste of what might have been with Investigations of Noah Vale? Even a brief synopsis of what it would have been would be a treat. I never got beyond the title before I decided on a superhero instead. I could see the funny-private-detective idea did not have a fraction of the potential humor and action as the funny-superhero idea. 12 – There is something of a physical resemblance between Lancelot Pertwillaby and yourself, to say the least! I’m curious why you chose to do that, and why you kept that up with Captain Kentucky. Same reason I did it in the previous strip. Just for fun. Readers did not know that was what I looked like. And I thought, with my wimpy face, red hair and glasses, I was certainly an unlikely looking “hero”. 13 – I’ve seen you quoted that you tend to view your stories as movies. What kind of musical scoring would you assign to The Pertwillaby Papers and Captain Kentucky? And of course I have to ask the same about your Duck comics. Franz Waxman. Or Bernard Herrmann. Maybe Erich Wolfgang Korngold. Perhaps Max Steiner. I dunno — I’d hafta hear what each one could come up with if I hired them. Which would be difficult since they are deceased. 14 – Both The Pertwillaby Papers and Captain Kentucky are serialized stories, even marked as episodes in the titles. It’s a big difference from the “one-and-dones” of the Duck comics you are so well known for. How did that serialized nature affect the way you wrote the comics? 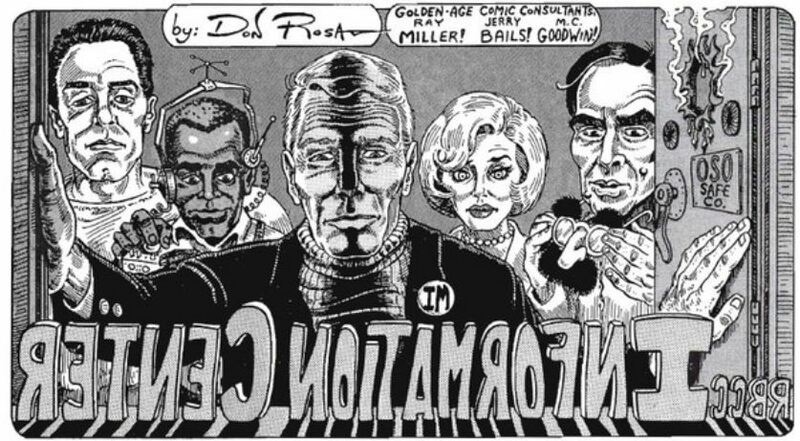 I can’t recall specifically, but I really enjoyed doing serials with cliff-hanger endings! And yet, I would never have wanted to do that in my Duck comics since that’s NOT how Barks’ Duck comics were done. Of course, Europeans are forced to get used to seeing Barks stories serialized since that’s how their Disney comic system has been set up for 60 years. And my stories were always serialized in Europe. But I always wrote them as single-part stories that the publisher could cut into parts without too much damage. Comic book stories should NOT be continued. Then all you have is a modern American super-hero comic book story and that’s what happens when writers don’t feel like creating more than one plot every year, but still get paid by the page. 15 – Amen to that. I do still actively buy and read current comics (in addition to the old ones) and with the modern style, it creates some serious pacing problems, all for the sake of trade paperbacks. Part of what I think makes your work so interesting is how much you cram in to your layouts with the way you use panels… I seem to recall you mentioning in between panels of an episode of “Sub-Zero” that you had two pages of plot that you had to squeeze in to one. How often did you experience that page count limitation? As to my Duck stories, I was ALWAYS suffering under the page-count limitations! It was only towards the end, when I was really getting fed up with the Disney comics system (for many reasons) that I stopped worrying about the page counts, and I would let the story run over my allotted page limitations… I guess I was to the point of “They can take it or leave it… I don’t care anymore”. 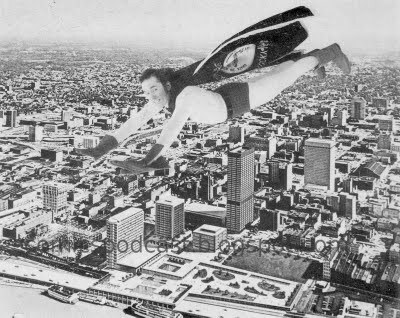 16 – I found this picture of you actually dressed as Captain Kentucky, and flying at that (or at least rear-projected/green-screened)! Care to give a little background on the subject? Well, back around 1980 my wife made me a Captain Kentucky outfit so I could make personal appearances on TV or such. I think I only did that once or twice. The main use was when I did the 100th episode of “CK” which I did in all-photographs. The pic you have was very simple to achieve. I simply stood leaning backwards with my arms in the air so my cape would hang straight down, then had a photographer stand on a ladder and photograph me from above and to one side. Then they pasted that onto an aerial view of Louisville. Simple. I also used that photo as my “8 X 10 glossies” to autograph and send to the few fans who would write. 17 – At least three additional non-Pertwillaby Papers/Captain Kentucky stories, Khulan, Tagdenah and Phalanx are also being published in Deluxe Collection. Could you tell me a little about them? Well, I guess I’ll write complete descriptions of their origins for Jano’s books, but in short: I did “Khulan” in high school in the late 60’s when “sword & sorcery” stories became so popular. A good friend was a Robert E. Howard fan and wrote that story for me… notice that “Khulan” seems to maybe be a combination of the names of Howard’s main heroes Kull and Conan. “Tagdenah” was written by another S&S fan I met around 1977… she had a drug habit and I thought maybe a sense of pride in some creation would help her out (I failed in that… she eventually died of a drug overdose, so I was told). “Phalanx” was something I tried in college around 1972 after discovering “Asterix” in a library (to this day, neither Asterix or Tintin or any other Euro comics are known to the American public — people think Tintin was created last year for that new movie). “Phalanx” was going to be an attempt to duplicate the Asterix style of funny adventures based on actual history, and it was written by a college history professor pal I’d gotten to know after he probably mentioned a Barks story in one of his lectures. Um… I don’t recall why we did it as a daily strip rather than a comic-book style story for a fanzine. 18 – From what I’ve been able to glean through research, “Knighttime” (the last Pertwillaby Papers story) was intended to have at least one more episode. I know this is something of a pipe dream, but what would it take in this fundraiser for the readers to see either a storyboarded or fully drawn conclusion in your collection? No chance of that. My eyes are too far gone. Retinas falling off onto the floor. But there’s no need! The ending to “Knighttime” WAS used as a Duck adventure! At the end of the story, the Black Knight (Merlin) would die when a rug was pulled out from under his feet and he fell to the center of the earth (a demise I softened for Arpin Lusene in the Duck version), then when the heroes tried to transport back to the present, Lance was to have succeeded in sending everyone back using the power of the machine, but he was a microsecond SLOW in sending HIMSELF back, and he materialized at the edge of outer space, the Earth having moved slightly in its orbit during transfer. But, by gravity, he would then fall to Earth protected (slightly) by the space suit you see him wearing in the story for other reasons. This ending was used as the ending for “The Duck Who Fell to Earth” story with $crooge and Donald. 19 – People sometimes talk about ‘the ideal reader’, the type of person whom above all else an individual author writes for. Who is your ideal reader? 20 – My last question is not so much related to the project itself or even your work, but it’s one I’ve been dying to ask. What, in your opinion, are the qualities of a truly good (or great) comic book story? But let’s see… as far as I’m concerned, a truly great comic book story is one that is contained in ONE issue, one comic or one album. And I also happen to think that all the truly TRULY great comics are those done by ONE person… written and drawn by a single mind. I am 100% positive of that. Those stories will always have a special quality that no multi-personality creation can ever achieve. That’s not to say that the multi-personality stories may not be entertaining. But they can never have that same magic indefinable spark as those done by a single brain. My stories would never have been noticed if I had not been both the writer AND artist. As a writer-only, I could never insist on the level of detail and sheer unbounded enthusiasm and endless background gags that an artist would waste his time inserting into his art. (Besides, that stuff is not in my own scripts — it just pops out spontaneously when I’m drawing.) And as an artist-only, I would never insult the writer by inserting all of those background gags and hidden plots and homages as if telling the writer that his story wasn’t good enough until I “punched it up”. Also, no writer would want to work with an artist who worked as painfully slowly as I did due to my lack of training and professionalism — he’d want his paychecks faster than that! But as the writer AND artist, I had no one to answer to but myself. Review Or Die Create a free website or blog at WordPress.com.